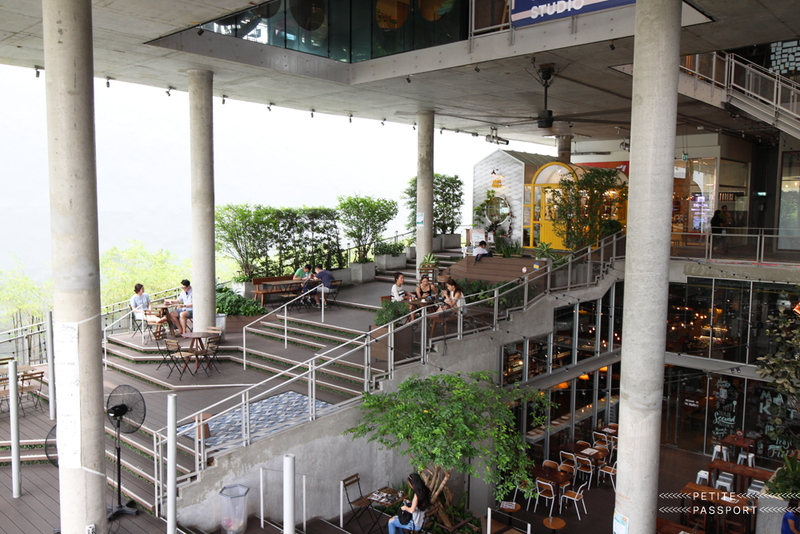 Bangkok loves food courts and the latest, most upscale interpretation of social dining is The Commons in the hip & trendy Thong Lo neighborhood. It offers food from the market stands of great restaurants like Soulfood, casual indoor seating as well as terraced outdoor seating in the atrium. Great food and great vibes make this a great new addition to the blossoming Bangkok food scene. Only ten years ago, finding good food other than Thai food in Bangkok was a challenge – so much has changed. Thai’s have always loved good food in a very social setting, whether at a street-side food stand or in a fine-dining restaurant. And every new mall in Bangkok brought a new, trendier food court. The Commons is a new, great interpretation of the food court. A number of well-known restaurants, like my personal favorite Soulfood Mahanakorn, have set up small stalls in an indoor, market-style setting. You can order some of their best dishes from a (much shortened) menu at their counter. Just like in a food court, there are lots of choices, including great pizza from Peppina, Ribs from Meat & Bones or delicious fried chicken from Fowlmouth (I admit, I had it twice)! There is also a large selection of craft beers (of course) and wine (less of course). Once you all ordered your food, you can find a table to hang out. The outdoor atrium is a wonderfully designed space. Steep stairs from the street keep the noise out, making it feel like a private garden. The seating up the interior stairs is casual and fun and perfect to people watch. There are also larger more private tables upstairs. Above all spin some of the largest ceiling fans I’ve ever seen, keeping it cool enough, even in hot Bangkok. If you’d prefer an (air conditioned) restaurant experience, head all the way to the top and you’ll find Roast, a restaurant I especially liked for brunch, with scrumptious dishes that are likely to lead to over-eating! Apparently, I’m not the only who loves this place – you’ll need reservations for Roast and the food market was busy every day we went, even on weekday evenings. But it’s a casual place, so you’ll fit in somewhere, maybe even make some new friends along the way. So, head to the trendy Thong Lo neighborhood for a nice dinner. The closest BTS SkyTrain stop is Thong Lo and it’s about a 15 minute walk or short taxi ride. On the way home, don’t miss J Boroski, for the best cocktails in town!